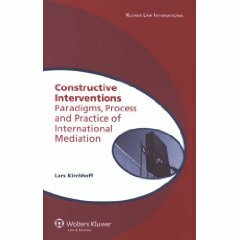 Lars Kirchhoff, Constructive interventions: paradigms, process and practice of international mediation, Kluwer Law International, c2008. This book exposes the contemporary structural barriers to effective conflict resolution, and then defines where adjudication should end, and where ADR and mediated third party intervention should begin. The author argues that by bringing adjudication and ADR together, the best chance for an effective system of international justice emerges. The work illustrates the various departure points and perspectives of scholars, discusses who should become involved in conflicts as a third party, systematically conveys the nature and consequences of intervention, and clarifies the particular model of international mediation under development through UN initiatives. Simon Baughen, International trade and the protection of the environment, Routledge-Cavendish, c2007. Analyzing globalization and the increasing tension it has caused between the goals of free trade and environmental protection, this book provides a comprehensive and detailed legal analysis, both at the national and international level, of what looks to become the new legal order of the twenty-first century. The author asks whether the treatment of "measures tantamount to expropriation" will lead to a regulatory chill on environmental protection and analyzes the possibilities for claims before the UK courts that are based on alleged violations of international law. Donald W. Glazer, Scott FitzGibbon, Steven O. Weise, Glazer and FitzGibbon on legal opinions: drafting, interpreting, and supporting closing opinions in business transactions, 3rd ed., Aspen Publishers, c2008. Li Lin, et al., eds., The China legal development yearbook, Vol. 1: on the development of rule of law in China, Brill, c2008. Thomas Lundmark, Power & rights in US constitutional law, 2nd ed., Oxford University Press, c2008. Philip Weinberg, Kevin A. Reilly, Understanding environmental law, 2nd ed., LexisNexis Matthew Bender, 2008. American Law Institute, Intellectual property: principles governing jurisdiction, choice of law, and judgments in transnational disputes: as adopted and promulgated by the American Law Institute at San Francisco, California May 14, 2007, American Law Institute, c2008. Simon Baughen, International trade and the protection of the environment, Routledge-Cavendish, 2007. Roberta Arnold, ed., Law enforcement within the framework of peace support operations, Martinus Nijhoff Publishers, c2008. Christopher F. Dugan, et al., Investor-state arbitration, Oxford University Press, c2008. TJ Grierson Weiler, ed., Investment treaty arbitration and international law, JurisNet, 2008. John Palfrey, Urs Gasser, Born digital: understanding the first generation of digital natives, Basic Books, c2008. Joseph A. Custer, Christopher L. Steadham, Kansas legal research, Carolina Academic Press, c2008. Housing Assistance Tax Act of 2008: (P.L. 110-289) as signed by the president on July 30, 2008: law, explanation and analysis, CCH, 2008. After Blackstone: should small investors be exposed to risks of hedge funds? Airport and Airway Trust Fund: the future of aviation financing: hearing before the Committee on Finance, United States Senate, One Hundred Tenth Congress, first session, July 12, 2007. Assessing the impact of a safe and equitable biosimilar policy in the United States: hearing before the Subcommittee on Health of the Committee on Energy and Commerce, House of Representatives, One Hundred Tenth Congress, first session, May 2, 2007. Continuation of 9/11 health effects: environmental impacts for residents and responders. Crisis in the Andes: the border dispute between Colombia and Ecuador, and implications for the region. Forest restoration and hazardous fuels reduction efforts: hearing before the Subcommittee on Public Lands and Forests of the Committee on Energy and Natural Resources, United States Senate, One Hundred Tenth Congress, first session. December 13, 2007. Forming a comprehensive approach to meeting the water resources needs of coastal Louisiana in the wake of Hurricanes Katrina and Rita. H.R. 5512: the Coin Modernization and Taxpayer Savings Act of 2008. Internet Tax Freedom Act: Internet tax moratorium: hearing before the Subcommittee on Commercial and Administrative Law of the Committee on the Judiciary, House of Representatives, One Hundred Tenth Congress, first session, May 22, 2007. Lebanon on the brink: hearing before the Subcommittee on the Middle East and South Asia of the Committee on Foreign Affairs, House of Representatives, One Hundred Tenth Congress, first session, November 8, 2007. Local Law Enforcement Hate Crimes Prevention Act of 2007. Medicare payment for physician services: examining new approaches: hearing before the Committee on Finance, United States Senate, One Hundred Tenth Congress, first session, March 1, 2007. Meeting the challenge: are missed opportunities costing us money? NCLB reauthorization: strategies that promote school improvement. Private Prison Information Act of 2007, and review of the Prison Litigation Reform Act: a decade of reform or an increase in prison and abuses? Reform of the Mining Law of 1872: hearing before the Committee on Energy and Natural Resources, United States Senate, One Hundred Tenth Congress, second session, to receive testimony on reform of the Mining Law of 1872, January 24, 2008. Supporting the front line in the fight against crime: restoring federal funding for state and local law enforcement. The Balkans after the independence of Kosovo and on the eve of NATO enlargement: hearing before the Committee on Foreign Relations, House of Representatives, One Hundred Tenth Congress, second session, March 12, 2008. The construction of the United States Capitol: recognizing the contributions of slave labor. The digital future of the United States. The founding father's papers: ensuring public access to our national treasures: hearing before the Committee on the Judiciary, United States Senate, One Hundred Tenth Congress, second session, February 7, 2008. The Holocaust Insurance Accountability Act of 2007 (H.R. 1746): Holocaust era insurance restitution after ICHEIC,the International Commission on Holocaust Era Insurance Claims. The need for credit union regulatory relief and improvement: hearing before the Committee on Financial Services, U.S. House of Representatives, One Hundred Tenth Congress, second session, March 6, 2008. The rise of drug-related violent crime in rural America: finding solutions to a growing problem: hearing before the Committee on the Judiciary, United States Senate, One Hundred Tenth Congress, first session, March 24, 2008, Rutland, Vermont. The state of climate change science 2007: hearings before the Committee on Science and Technology, House of Representatives, One Hundred Tenth Congress, first session, February 8, April 17, and May 15, 2007. The U.S. Postal Service 101. The use of federal housing and economic development funds in St. Louis. Treaties: hearing before the Committee on Foreign Relations, United States Senate, One Hundred Tenth Congress, first session, July 17, 2007. U.S.-Pakistan relations: assassination, instability and the future of U.S. policy. Voter registration and list maintenance (continued): hearing before the Subcommittee on Elections, Committee on House Administration, House of Representatives, One Hundred Tenth Congress, first session, held in Washington, DC, November 16, 2007. War powers for the 21st century: the Congressional perspective. War powers for the 21st century: the Constitutional perspective.